Mr. Ragone is a 62-year-old male who was admitted to The Hamlet Center at Nesconset after 17 days at Stony Brook Hospital, where he was a patient from August 28th through September 13th. Mr. Ragone was diagnosed with a fracture of the upper right humerus and a fracture of the vertebrae and pubis. 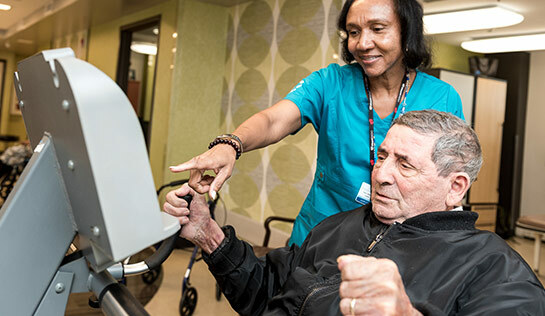 After his hospitalization, Mr. Ragone was notified that he would need extensive inpatient rehabilitation to support his range of motion and ability to ambulate once he was home. Mr. Ragone’s sister works as a nurse at Stony Brook Hospital, and a co-worker suggested The Hamlet because one of her family members is on the memory care unit, and they were very pleased with the care given. Mr. Ragone was greeted by multiple professionals of Team Hamlet, whom anticipated his arrival. Within the first 24 hours Mr. Ragone was seen by clinicians, therapists, physicians, administrative staff, and other valued members of the team who welcomed him and answered any questions he or his family had. His physical and occupational therapists began his therapy program at bedside to evaluate his current state of health and mobility in conjunction with his most recent therapy/clinical notes from Stony Brook. Mr. Ragone was admitted to this community to increase dynamic standing balance in order to facilitate safe functional mobility without loss of balance; to safely perform bed mobility tasks with use of side rails in order to get in and out of bed; and to perform stand pivot transfers and safely ambulate on level surfaces. Mr. Ragone received physical and occupational therapy six times a week for four weeks. During Mr. Ragone’s first week in therapy, patient demonstrated lack of full knee extension with right knee standing. While on program, Mr. Ragone required maximum assistance of one with bed mobility and was able to stand a total of 30-60 seconds. Mr. Ragone received static sitting balance training and dynamic sitting balance training as well as therapeutic and progressive resistance exercises. Mr. Ragone performed marching in place exercises, and his present balance at that time was poor. After one week, Mr. Ragone walked 150 feet with minimum assistance. By week two, Mr. Ragone walked 150 feet without assistive devices or contact guard! Mr. Ragone was able to safely perform bed mobility tasks with minimum assistance with use of side rails to transfer to and from bed. Mr. Ragone was also able to perform stand pivot transfers with stand by assist! Through three weeks, Mr. Ragone was ambulating 200 feet without assistive devices! Throughout his therapy, Mr. Ragone’s therapists would continue to provide helpful tips in transitioning from rehabilitation center to home. Due to the teamwork and cooperation of our entire nursing team, occupational and physical therapy team, and all professionals who made Mr. Ragone’s stay so positive, Mr. Ragone was able to have a pleasant stay here at The Hamlet. When our concierge asked how he would rate his overall stay, Mr. Ragone replied, “If the best is 10, I would have to say an 11!” We wish him the best of luck and a safe return home!